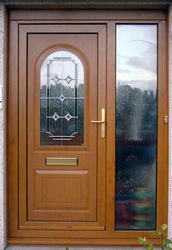 Our product range includes a wide range of residential wooden doors. keeping track with the market development, we are offering optimum quality Residential Wooden Doors. These doors are resistance to termite and are polished in such a way that makes it more shiny and attractive. Features Wooden doors can be painted or polished in any shades Maintenance of wooden doors is easy and cheap Wooden doors are not affected by temperature because woods have higher R value Wooden doors are less prone to condensation, as these are bad conductor of heat and electricity.